Elizabeth Cady Stanton, Susan B. Anthony, and Lucretia Mott who started the movement with the Seneca Falls Convention in 1848. 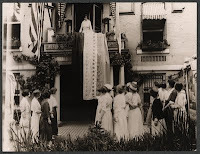 Lucy Burns and Alice Paul of the National Woman's party who started picketing in front of the White House and brought a lot of publicity to the cause of Suffrage. The National America Women Suffrage Association also had their hands in helping to win the vote. The President of that organization was Carrie Chapman Catt. I'll share two of my favorite pictures from the Suffrage Movement. 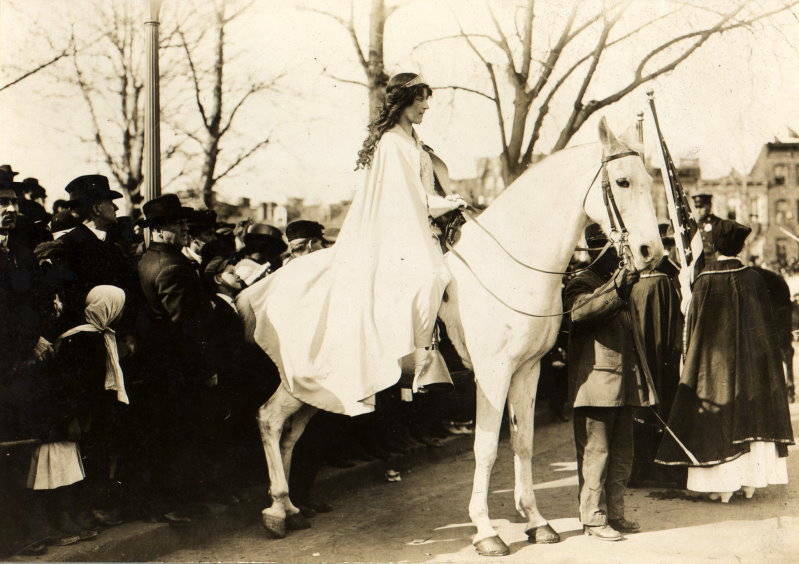 The first one is Inez Milholland who lead the parade on her white horse on March 3, 1913 in Washington, DC. A riot broke out at this parade and men broke through the parade lines to show their distain for the women in the parade. This last picture is the day the Suffrage Law passed. Alice Paul threw the NWP banner over the side of the headquarters to show her excitement. I cannot even comprehend the emotions that she had after being what she had been through to see the 19th Amendment passed. It is unbelievable to me the strides that have been made since the convention in 1848. It took Congress 72 years after that to pass the bill to give women the right to vote. Some of the leading ladies who fought for this right were not alive to see it pass. Still, not all women on this Earth have the right to be heard. We are fortunate women who live in the US, Canada, and the many other countries have been given the right to be heard on subjects that affect us! I would highly recommend watching "Iron Jawed Angels" if you would like to learn more about this movement and what was done to win the right for us to vote. Some parts are graphic and may not be appropriate for young viewers.